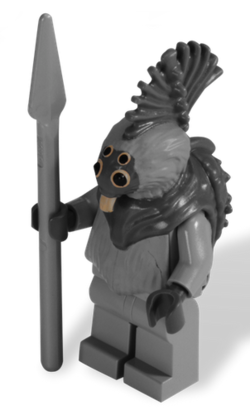 Thi-Sen, also known as Talz Chieftan, is a Star Wars minifigure introduced in 2010. Thi-Sen had a plan grey leg piece, and a plain grey torso piece with grey arms and dark grey arms. He has a dark grey "sandwich-board" piece, which connects to the torso's neck joint and covers most of the torso, as well as acting as the minifigure's head. The mould of the piece is based specifically on Thi-Sen, having many features common for the Talz species, including four eyes and a small proboscis. The mould also features Thi-Sen's clothing and the headpiece that he wore as a symbol of leadership. The dark grey piece features grey printing for areas of piece representing exposed fur, tan and black printing for the four eyes, and tan printing for the proboscis. The face area is left an unprinted dark grey colour, matching the darker patch of fur common on many Talz around the face. Thi-Sen comes with one accessory- a silver metallic spear. Thi-Sen was the chieftain of a group of Talz who lived on Orto Plutonia, a planet which was considered under the jurisdiction of its moon, Pantora, by the Republic Senate. During the Clone Wars, both the Republic and Separatists had an interest in the planet. While the Republic tested their speeders in the harsh icy environment, the Separatists launched an attack on the peaceful Talz. The Talz launched a counterattack, destroying both Separatist and Republic bases. The Republic later sent another clone task force, as well as the Chairman of Pantora, Chi Cho, Pantoran Senator Riyo Chuchi, and Jedi Obi-Wan Kenobi and Anakin Skywalker. The Jedi arranged a cease-fire agreement with Thi-Sen, however Cho, believing the Talz to be trespassers in his territory, declared war. The Jedi ordered their clone troopers to protect Chairman Cho while they went to get Senator Chuchi so that she could attempt to negotiate peace. A battle ensued, where many clone troopers and Talz were killed, and Cho was severely injured. However, the Jedi returned with Chuchi, who received approval from the Pantoran Assembly to make peace with the Talz as Cho died. With the help of the protocol droid C-3PO, Chuchi and Thi-Sen made a peace treaty, with the Pantorans giving sovereignty of the planet to the Talz, and the Republic agreeing to withdraw their forces. The Holo-Brick Archives misspelled his name as "Thi-San". This page was last edited on 13 January 2016, at 00:04.